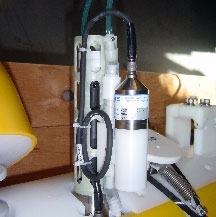 Since the surface layer in Hood Canal can be quite shallow, an instrument called an Acoustic Doppler Current Profiler (ADCP, Figure 1) was used in addition to a McLane Moored Profiler on this mooring, to sample the water column between the profiler and the surface. The moored profiler uses a traction drive to crawl up and down a taut mooring wire anchored to the bottom and suspended from a shallow subsurface float (Figure 2). This float is 4 m below mean lower low water (MLLW). The ADCP sampled the currents between the float and the surface, which was 4-8 m above the float depending on the tide. Together, the moored profiler and the ADCP thus sampled velocity in the entire water column. Onboard sensors (Figure 3) recorded profiles of temperature, salinity, oxygen, velocity, and density twice each hour with 30-cm vertical resolution, allowing precise, rapid, high-resolution monitoring of these quantities. In addition, the density records were used to infer the turbulent diffusivity, which governs the vertical supply of nutrients to the euphotic zone, and the downward supply of oxygen to the deeper layer. The velocity and oxygen records allowed us to measure the lateral supply of oxygen and nutrients to South Hood Canal. We used these records, together with model output, to piece together the three-dimensional flow fields in the Canal, which in turn are key in setting the oxygen distribution. In an effort to learn more about the cross-channel variability of water properties and flow, in April 2006 the MMP mooring was re-located to the north, about 300 m to the NW of the ORCA buoy at Duckabush. In place of the MMP mooring at Hoodsport we deployed an Acoustic Doppler Current profiler (ADCP) “doublet” mooring---a subsurface float equipped with two ADCPs---one looking upward and sampling from the water column above the float, and the other looking downward and sampling from below the float. Together the ADCPs provide a velocity profile over most of the water column at high frequencies (1 minute) and with relatively good vertical resolution (< 4 m). This velocity timeseries compliments the timeseries from the nearby ORCA mooring to provide an invaluable timeseries of both flow and of water properties. This timeseries now consists of more than 18 months of nearly-continuous data, providing new insights into the annual cycle of dissolved oxygen in southern Hood Canal. While the profiler cannot capture the surface layer of the water column without surfacing, an ADCP samples between the top float and the surface. An Acoustic Doppler Current Profiler mounted in a subsurface float. MMP sensors, including a Seabird CTD. Side view of a McLane Moored Profiler. ADCP (ACM) and CTD sensors are visible, as well as the guide wheels, cable retainer, and motor through which the mooring cable passes. MMP is mounted vertically.